where Pioneer and Prairie clothes for Girls and Ladies is all we do. the clothes of the prairie were designed to be plain, simple, practical and durable. but by and large, simplicity was the name of the game. All items are made by hand with the best quality products available today. the designs were developed specifically for the 1800's. From the simplest to the fanciest, you will find it here. Scattered about the website are bits of historical trivia that I have collected over the years. Some of the information I found in my own research when I opened my shop years ago in downtown Rochester, Michigan. community and spends her spare time - in historical costume - speaking on the subject to school groups and service organizations. I was awestruck the day she came into the shop to show me a button that came from an Army uniform from the Revolutionary War. My name is Carole Bodin and I am happy to serve you. Girls dresses and accessories and available in sizes 6 to 14. You can choose from our simple and sweet "Meg" dress or many others. all dresses are made from 100% calico cotton. 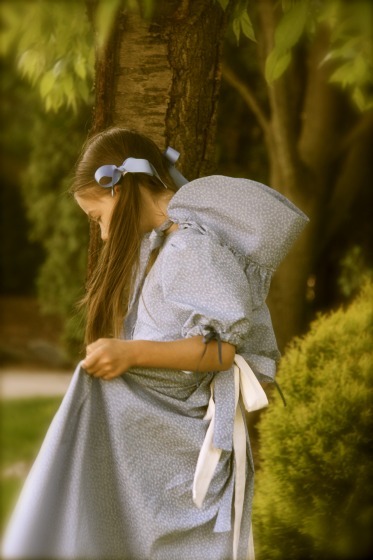 Matching doll dresses are available for all our pioneer designs. Made to fit American Girl or any 18" doll.